Download a blank fillable Form Ng-Enrl-La - Enrollment For Group Life Insurance, Dd Form 2558 - Authorization To Start, Stop Or Change An Allotment in PDF format just by clicking the "DOWNLOAD PDF" button. Complete Form Ng-Enrl-La - Enrollment For Group Life Insurance, Dd Form 2558 - Authorization To Start, Stop Or Change An Allotment with your personal data - all interactive fields are highlighted in places where you should type, access drop-down lists or select multiple-choice options. When filling out the Enrollment Form, ensure that you select the desired coverage amounts. info on page 2, it will also change it on page 1 (like your name or address for example). 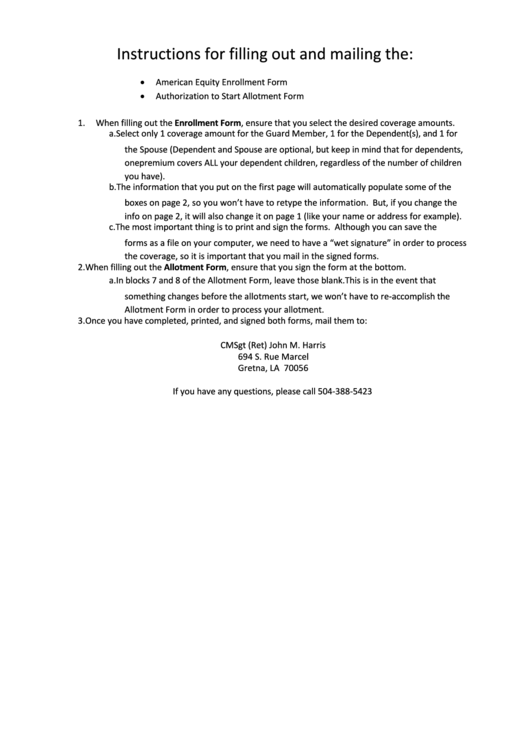 the coverage, so it is important that you mail in the signed forms. 2. When filling out the Allotment Form, ensure that you sign the form at the bottom. Allotment Form in order to process your allotment.